An Egyptian locality in the neighborhood of the Red Sea. In spite of all attempted combinations (Dillmann-Ryssell on Ex. xiv. 2) its situation is still unknown. An Egyptian god, B'irati Dapuna—that is, Ba'alat Ẓaphon—is mentioned by the Egyptians themselves (W. Max Müller, "Asien und Europa," p. 315). The name calls to mind the Phenician , which designates both a god and a place. 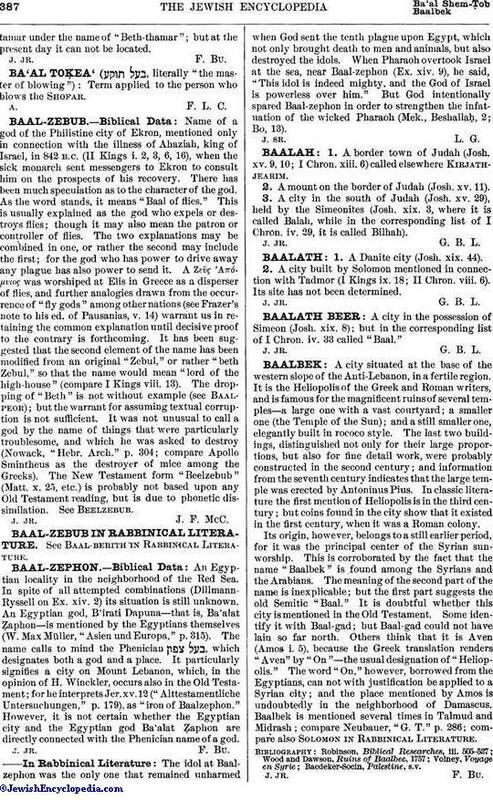 It particularly signifies a city on Mount Lebanon, which, in the opinion of H. Winckler, occurs also in the Old Testament; for he interprets Jer. xv. 12, ("Alttestamentliche Untersuchungen," p. 179), as "iron of Baalzephon." However, it is not certain whether the Egyptian city and the Egyptian god Ba'alat Ẓaphon are directly connected with the Phenician name of a god. The idol at Baalzephon was the only one that remained unharmed when God sent the tenth plague upon Egypt, which not only brought death to men and animals, but also destroyed the idols. When Pharaoh overtook Israel at the sea, near Baal-zephon (Ex. xiv. 9), he said, "This idol is indeed mighty, and the God of Israel is powerless over him." But God intentionally spared Baal-zephon in order to strengthen the infatuation of the wicked Pharaoh (Mek., Beshallaḥ, 2; Bo, 13).